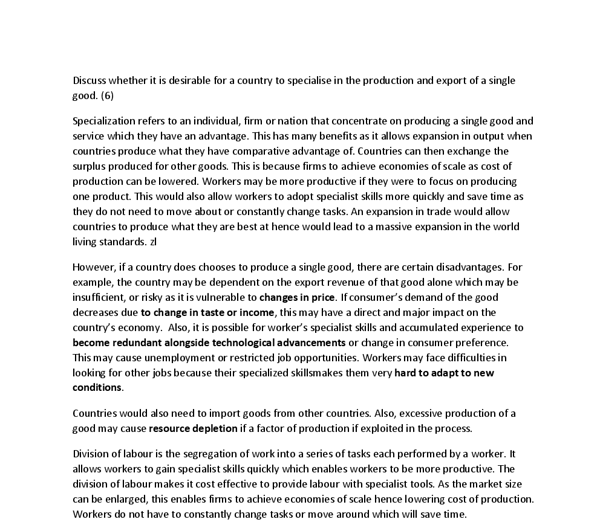 Discuss whether it is desirable for a country to specialise in the production and export of a single good. 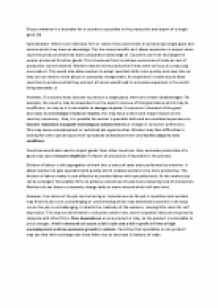 ﻿Discuss whether it is desirable for a country to specialise in the production and export of a single good. (6) Specialization refers to an individual, firm or nation that concentrate on producing a single good and service which they have an advantage. This has many benefits as it allows expansion in output when countries produce what they have comparative advantage of. Countries can then exchange the surplus produced for other goods. This is because firms to achieve economies of scale as cost of production can be lowered. Workers may be more productive if they were to focus on producing one product. ...read more. If consumer?s demand of the good decreases due to change in taste or income, this may have a direct and major impact on the country?s economy. Also, it is possible for worker?s specialist skills and accumulated experience to become redundant alongside technological advancements or change in consumer preference. This may cause unemployment or restricted job opportunities. Workers may face difficulties in looking for other jobs because their specialized skillsmakes them very hard to adapt to new conditions. Countries would also need to import goods from other countries. Also, excessive production of a good may cause resource depletion if a factor of production if exploited in the process. ...read more. However, the nature of the job can be boring or monotonous as the job is repetitive and workers may find the job to be unchallenging or uninteresting which may demotivate workers in the long run.As the job is unchallenging, it retards the creativity of the workers, leaving little room for self expression. This may be detrimental in industries where new, more innovative ideas are required to compete with other firms. Over dependence on one product is risky, as the product is vulnerable to price changes. A fall in demand can cause a fall in sale and a fall in profit in firms or high unemployment and low economic growth in nations. Countries that specializes in one product may see that their exchange rate have fallen due to decrease in balance of trade. ...read more. The cement industry has started using coal, both local, as well as, imported to replace natural gas and furnace oil. During July-March 2003-04 the production of crude oil per day has decreased to 62,139 barrels, from 64,905 barrels per day during the same period of last year, showing decline of 4 percent. employing migrant labour 4. Sufficient education [e.g. literacy, numeric and computing skills] 5. Flexibility [requires a broad general education as well as in-depth knowledge of a particular task] 6. Workers need to be able to contribute to change - e.g. every worker can contribute ideas to the improvement of technique of production.